In the GIS Cloud Manager, under the Users tab you can create and manage your organization, assign licenses and manage user groups. After purchasing, every license must be assigned to a user. Map Editor and Map Viewer licenses have to be assigned to the user who uses the application. All MDC licenses have to be assigned to the project owner, so he can manage sharing permissions for MDC (Collect, Update). Map Portal license doesn’t have to be assigned to the user. User can create sub users, which will be part of an organization. 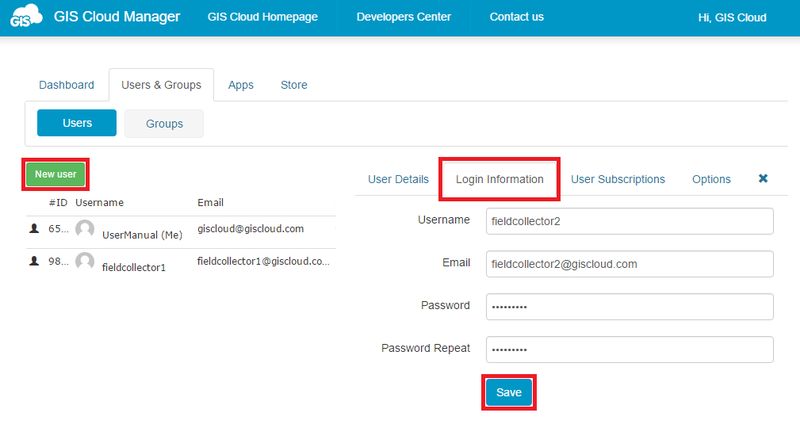 Log in Manager app (https://manager.giscloud.com/) with the GIS Cloud credentials. Go under the Users tab and click New user button. Add the first and last name (Users details tab), username, email and password (Login information tab). Those fields are required. User can be edited by double clicking on the username. 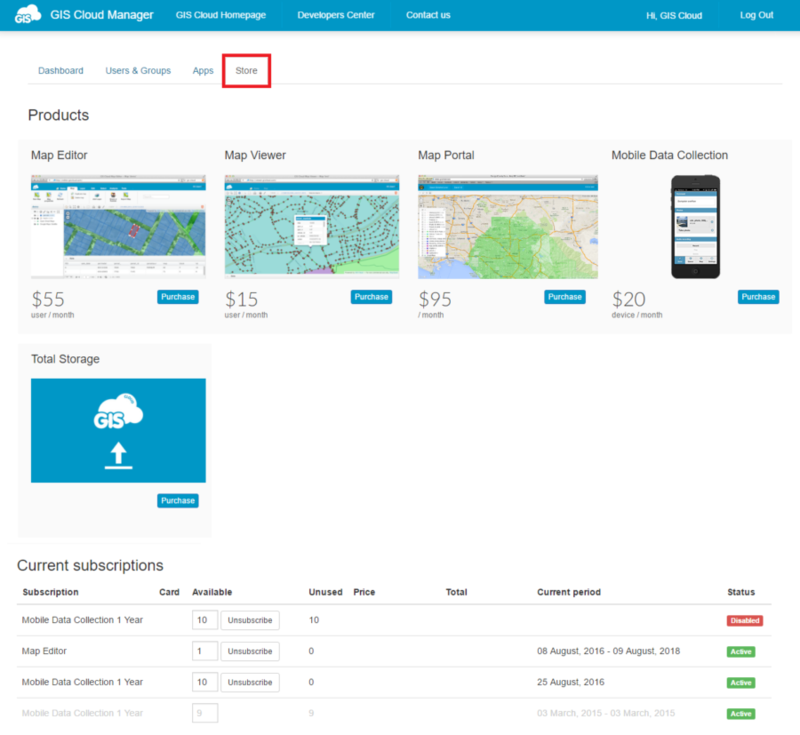 All GIS Cloud licenses can be purchased in Manager app, under Store tab. Select one of apps and choose the plan. Note: if you have a question regarding licenses or the plan, don’t hesitate to contact us at sales@giscloud.com . 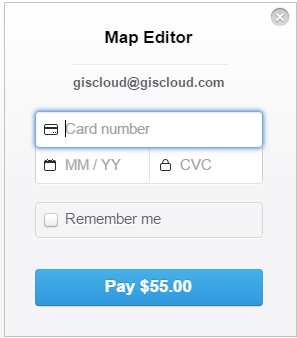 Add credit card information and Pay button. All subscriptions can be reviewed in Manager app, under Store tab, on the bottom of the page. Map Editor and Map Viewer license have to be assigned to a user who will use the app. Double click on the user whom you want to assign Map Editor or Map Viewer license. The menu will open on the right side. Go under User Subscriptions tab. Select Choose Subscription option next to the Map Editor or Map Viewer. All MDC licenses have to be assigned to the project owner, not collectors in the field. Project owner can assign Collect and/or Update permission for each user. Double click the project owner username. Select Choose subscription next to Mobile Data Collection app. Note: For Mobile Data Collection app it’s necessary to assign license to a project creator, not to a collector in the field. E.g. 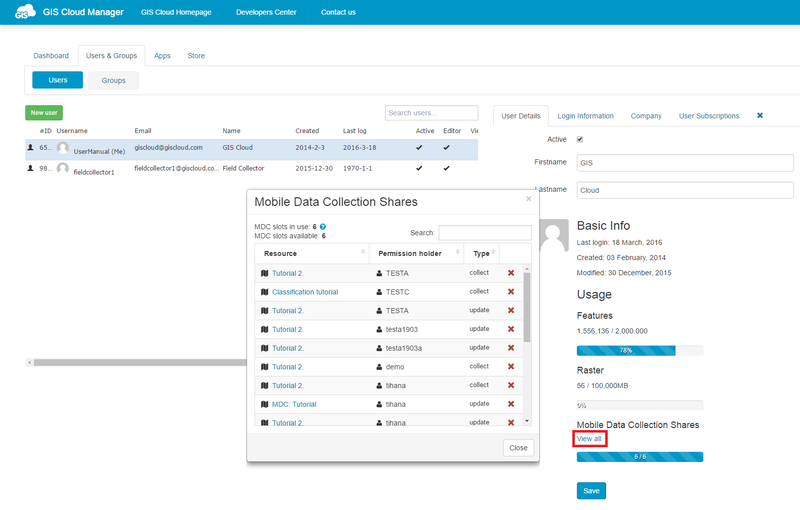 if you assign five Mobile Data Collection licences to one user, he will be able to create a project and share it to the five other users in the field. Additional vector and other storage has to be assigned to the user who will be using it. Usually, it is the owner of the organization. Double click on the user whom you want to assign additional storage. The menu will open on the right side. Select Choose Subscription option next to Vector or other storage. Note: if you suspect that your storage is not calculated properly, in Map Editor (My account – Subscription) it is possible to refresh storage. MDC permission can be given to a map, layer and datasource. In the Manager, there is a list of all shared maps, layers and datasources. Number of MDC slots in use represents the number of unique users with MDC access to your resources. A single user takes up one slot, even if they appear multiple times, in groups etc. From the list you can remove all unnecessary MDC permissions and free your MDC slots. List of all shared resources will open. If you have forgotten your password, you can recover it here. If you need to change your password, you can do it in the Manager app, under the Users&Groups tab. Write password and then repeat it.